Photographing cheerleaders during the football season is kind of a hit or miss proposition. They’re always behind me and their routines don’t last very long so I’m lucky to get a few images before they end. The exception is if they do a halftime performance. 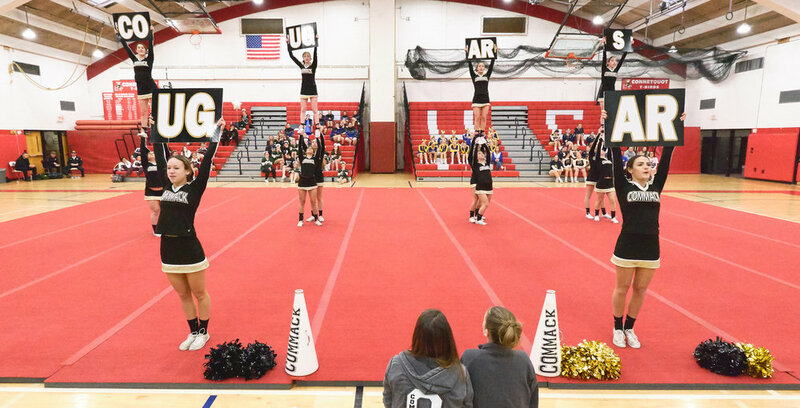 During the winter season cheerleading competitions are held most weeks so this makes things a bit easier. Since the competitions are indoors I’m looking for a school with good light. Connetquot just had their gym lighting upgraded in 2017 so this was a logical choice. Turns out, though the lights were much brighter than ours, the gym ceiling was domed so the lights were a lot higher off the floor. Even so, I ended up picking up an extra stop of light, which is always a good thing especially since I’m shooting with a 10-24mm f/4 lens. For cheerleading competitions I like to stay in the middle of the floor facing the cheerleaders. This ends up being behind the officials desk since only the coaches are allowed in front. This is just as well because shooting from the front of the desk would be way too close to the cheerleaders, even with a really wide lens. In order to keep the desk out of the photo I flip down my LCD screen and shoot with the camera over my head. It’s more difficult framing them this way but, unless they do tumbles, they’re relatively stationary so zone autofocus works well. Using the 10-24mm, I’m able to get the whole squad in most of the shots. If they spread out I’ll zoom into one section and concentrate on them. The only downside of the 10-24 is you have to watch your framing to keep the cheerleaders centered because of the distortion created by any super-wide lens as will as a bit of softness around the edges. Finally, since the routines don’t last very long you need to shoot fast. I’m always tempted to bring a second body with me with a longer lens but even in the short time it would take to switch cameras, I’d probably miss a lot. One thing I might try in the future is a remote camera behind the cheerleaders facing the crowd. These events are always well-attended and the crowd would make for a great background. In case you’re interested, all of the images were taken at ISO 10,000, 1/800 sec. @ f/4.5. That’s it for this post. Not a lot going on this week; most stuff is away. Another boys basketball game at home on Friday.